Rick Warren is a popular American spiritual leader and a writer of many amazing books, including his bestseller “Purpose Driven Life”. Pastor Rick is a founder of the Saddleback Church in Southern California, where he started preaching and spreading the word of God. More than 20,000 believers are included in his congregation, hoping to find peace and answer to all of their questions. Pastor Warren claims that once we find our purpose of living, we won’t spent our energy on insignificant things,but instead we will be more focused on completing God’s plan. 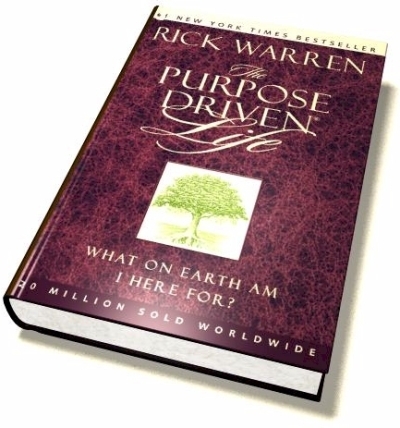 Beside his amazing book “Purpose Driven Life”, pastor Rick is an author of other inspiring and self motivating books like “The Daniel Plan:40 Days to a Healthier Life”, “What On Earth Am I Here”, Rick Warren’s Bible Study Methods and other amazing books. If you wondering why God send you on Earth, and what is your mission, then this is the suggested book you need to read. Pastor Rick suggests that readers should look deeper in order to discover the meaning of life. According to Warren, we are all God’s children born on planet Earth with a reason. We should not question his will or oppose to anything that comes along the way. Nothing happens without a reason. God has planned all of us for his purposes, and all we need to do is to complete his great will. If you are looking for an easy to read book that will improve your spiritual life, pick Warren’s “Purpose Driven Life”. The latest survey results show that this book is considered as the second most influential book after the Holy Bible. This 40-day spiritual journey will transform the reader, giving him a new meaning for the life. Warren use Biblical verses and quotes to help people understand the five purposes of human life on Earth, and to answer the question that many have asked ” What on earth am I here for? This book is both inspiring and challenging. It challenges people to discover their purpose on Earth and to improve their faith. “Purpose Driven Life” is a book of hope that helps readers to understand the biblical concepts and the importance of spiritual service, friendship and growth. Sold in more than 30 million copies all around the world, “Purpose Driven Life” gives daily inspiration through all 40 chapters.